The province went down to a last-minute defeat in South Africa yesterday evening. CONNACHT COACH KIERAN Keane lamented missed opportunities during his team’s last-minute 26-25 loss to the Toyota Cheetahs on Saturday evening. 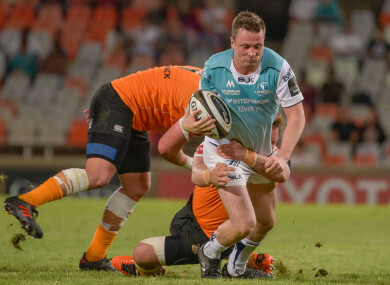 Cheetahs out-half, Niel Marais slotted a last-minute penalty to deny Connacht the distinction of becoming just the second away team after Glasgow Warriors to win a Pro14 match in Bloemfontein. This has put a serious dent in former champions’ chances of making the play-offs and has allowed no room for slip up against Edinburgh, Leinster, Glasgow and Ospreys in the coming weeks. Following the defeat the disappointment was visible and Keane indicated that had the province made better use of the opportunities on offer they would have boarded the flight back to Galway on Sunday morning with four points in the bag. “That was like a morgue in there from the boys. We didn’t come all the way here to make the numbers up, we came here to give our best and do our best,” the head coach said afterwards. “For probably 95 per cent of the time we did, but there we lost in the last few minutes. It is gut-wrenching for everybody to come this far and fall at the last hurdle. “We had some opportunities. We fluffed a couple of opportunities, just to put a margin out there and to make it mentally tough for them. Man of the match Matt Healy scored a brace of tries down the left following good team play by the visitors. Near perfect conditions in the City of Roses lent itself to an expansive game and this is exactly what both sides were targeting. “The Cheetahs are a team that play with a lot of width and we felt that the conditions are going to suite our game to play with width as well. That would have been a priory for us if the conditions allowed it,” said Healy. Towards the later stages Connacht were looking fatigued due largely to the altitude in the Free State, and so too were the hosts. The Cheetahs skipper, Francois Venter, conceded that the pitch was heavy on the night. Healy felt that cramp and the other side effects were not a valid excuse for the defeat. “I thought we were in great shape coming into the game. We had a really great week in Bloemfontein. Our strength and conditions staff had us in really top shape. We recovered really well after all our sessions during the week. Email “'Like a morgue in there': Keane laments Connacht's missed opportunities in SA”. Feedback on “'Like a morgue in there': Keane laments Connacht's missed opportunities in SA”.